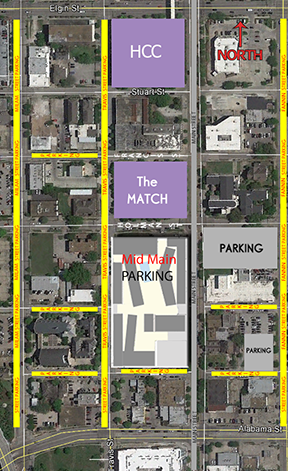 The MATCH site is 3400 Main Street, between Main to the East and Travis to the West, Holman to the South and Francis to the North. MATCH is two blocks South of Elgin and three blocks north of Alabama. The MetroRail makes a stop a half-block south of the MATCH at the Ensemble/HCC Station. e most of Midtown, you will have to pay to park, but prices are reasonable.